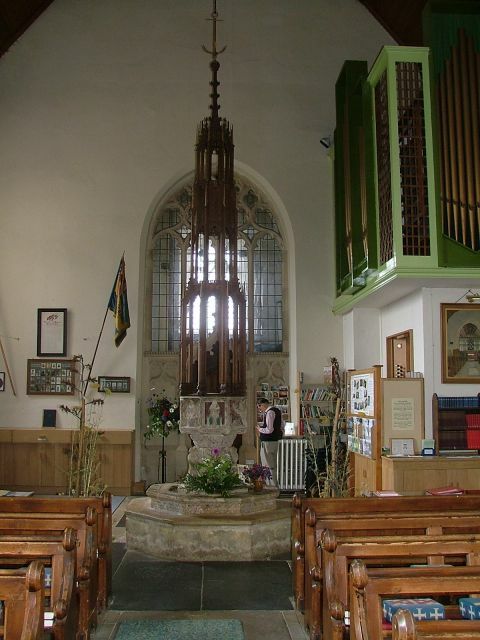 St Edmund is a fine building, with a pretty turreted round tower. The bell stage is a lovely Decorated adornment to the Norman tower, dating as it does from the 13th century rather than from the 15th as you more frequently find. 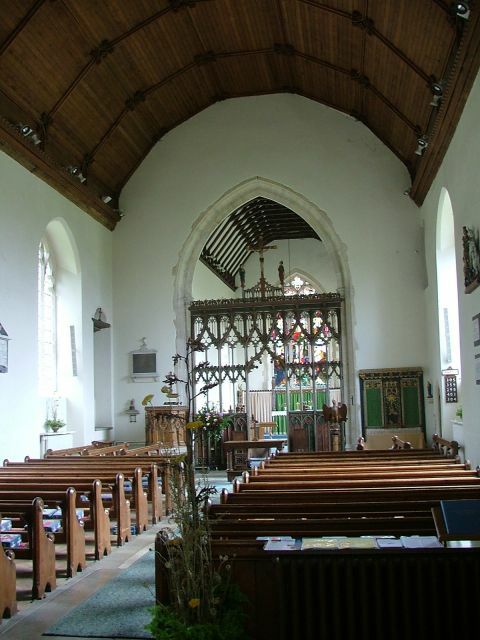 There is a thatched nave and a good mixture of medieval window traceries. A very late roodstair turret has been truncated, but is still striking. 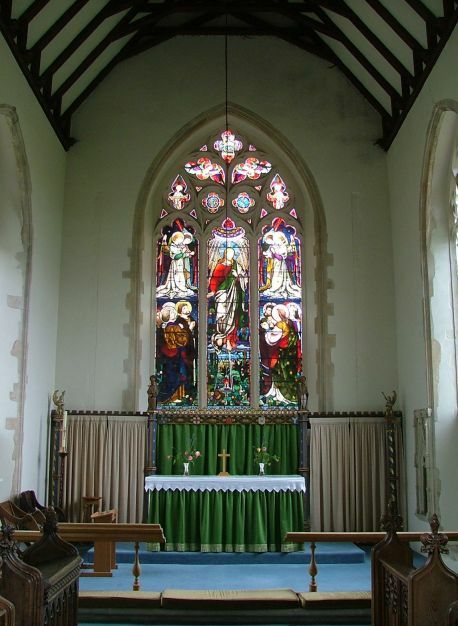 Beside it, a lowside window is set in an ogee-arched alcove. And that is just the exterior. For, just as outside it is not at all typical for an urban church, so the inside is similarly full of survivals of earlier times. St Edmund quite puts its town in the shade. 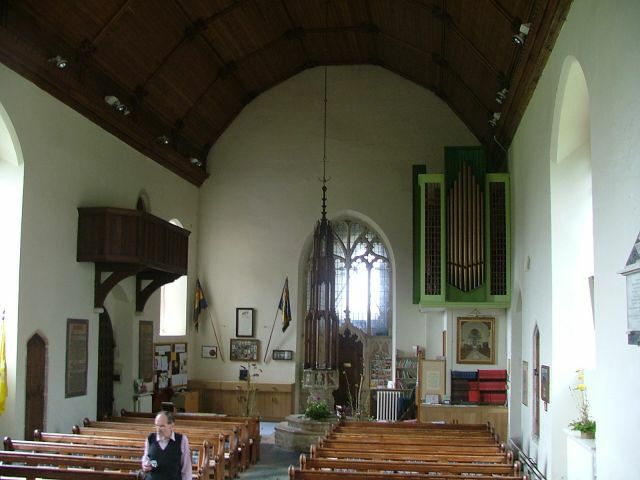 You step down into an interior which has been restored neatly but not overwhelmingly. As I said before, this does not have the feel of an urban church. 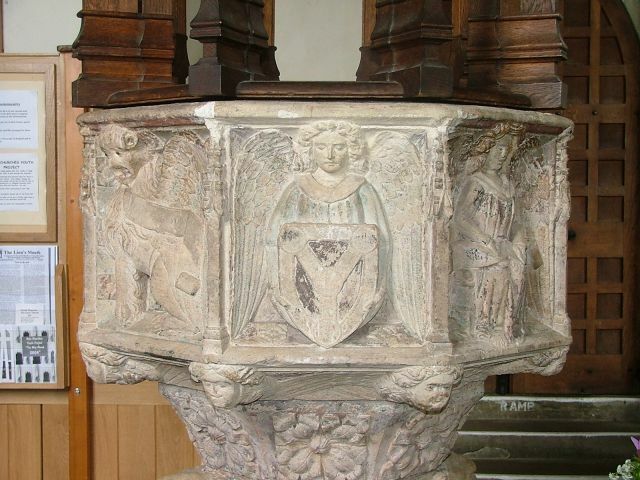 In front of you is one of the two great treasures of St Edmund, the 15th century font. 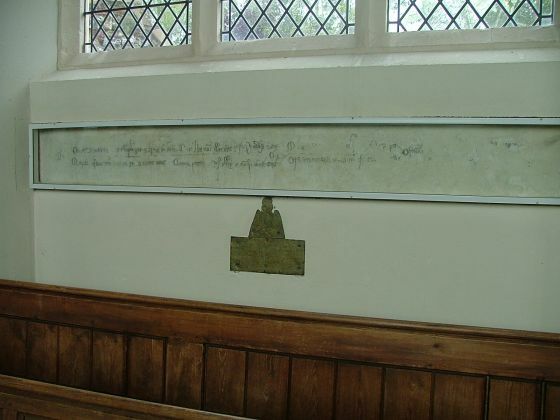 Curiously, the dedicatory inscription reveals 1410 as the year of the donation, but not the name of the donor. 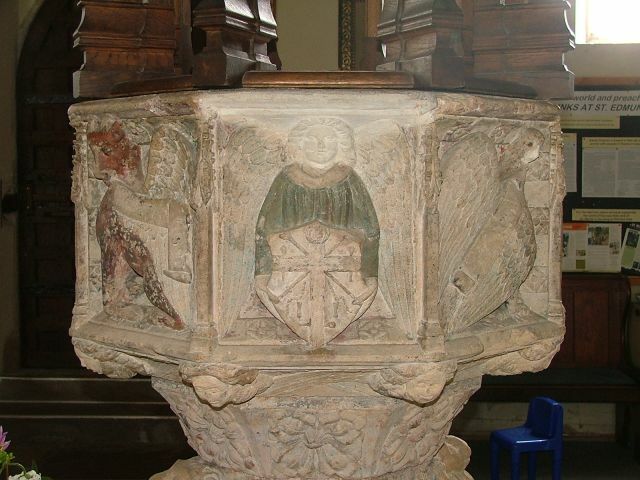 Four of the eight panels contain symbols of the four evangelists. Angels alternate with formal images in the other four panels. One angel holds a shield depicting the instruments of Christ's passion. 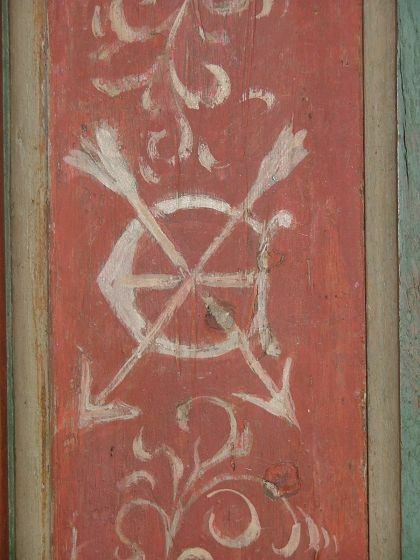 Another holds a shield depicting the symbol of the Holy Trinity. 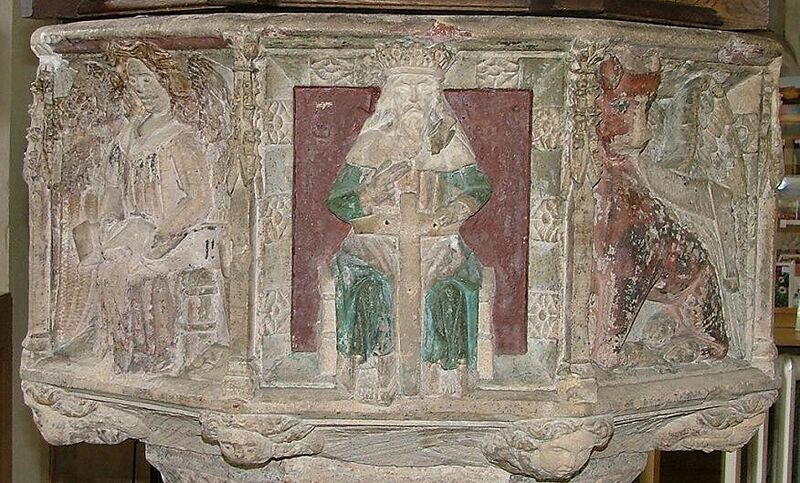 More powerful than this, the very rare medieval image of the Holy Trinity has also survived on this font; God the Father sits on a throne, holding the crucified Christ between his knees while the dove of the Holy Spirit descends. God's face has been smashed, probably by 16th century Anglican iconoclasts. The current face is a later restoration. Hauntingly, the stone cross still has the fixings for the body of Christ, which may have been made of wood or metal. 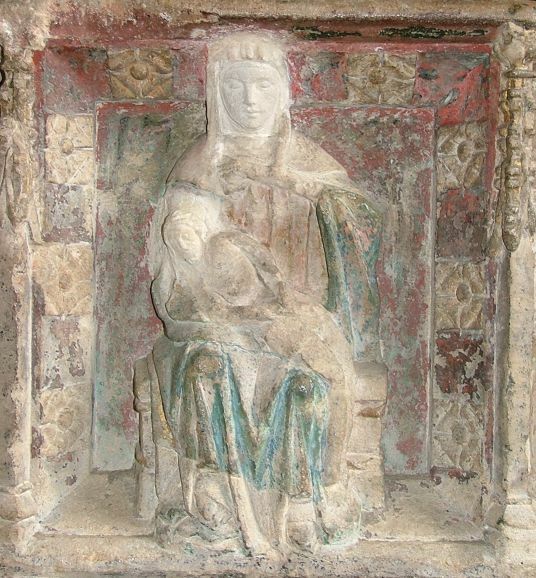 Opposite, the Holy Mother of God weeps with her dead Son on her lap. This image has also had its faces smashed out. 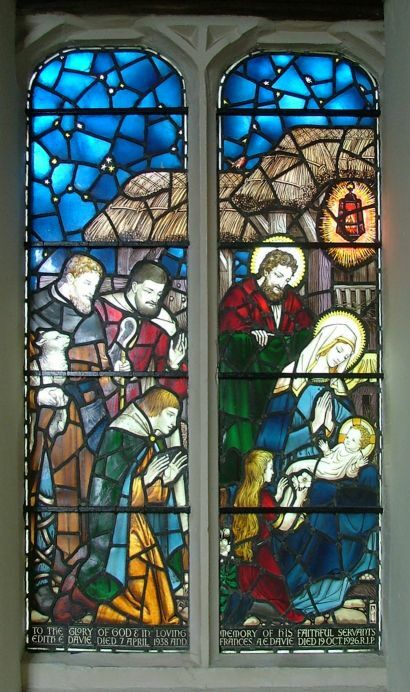 As with the image of God the Father, the more enlightened Victorians restored them sensitively, but I suspect Mary's face was originally more anguished - today, she appears rather serene. 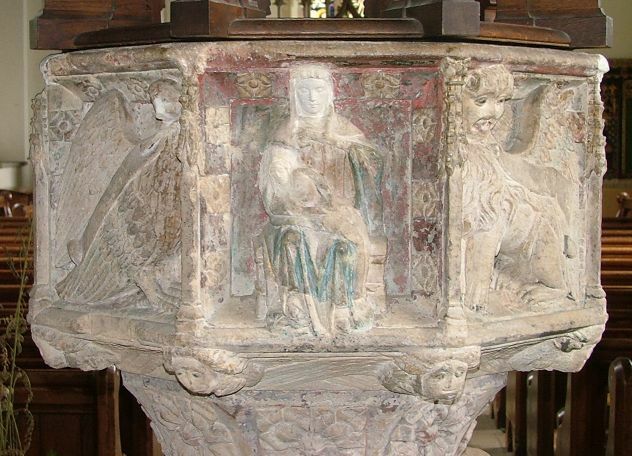 The whole piece is breathtaking, particularly since it retains much of its original colour. You can see images of some of the panels below. After the Reformation (but not before the faces could be smashed) it would have been plastered over before the Victorian restoration led to its being revealed. What does it all mean? 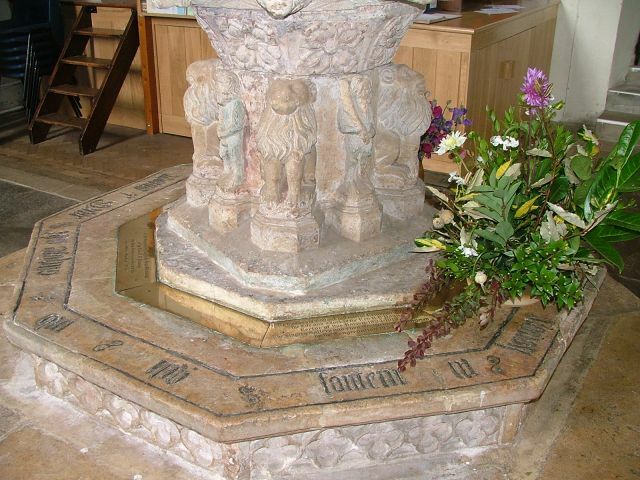 This font is an act of Catholic catechesis. It depicts images that are at once devotional and instructional, allowing the people to both use it as a focus for prayer, but also to form an understanding of doctrine. For this above all, it was broken and hidden from view. 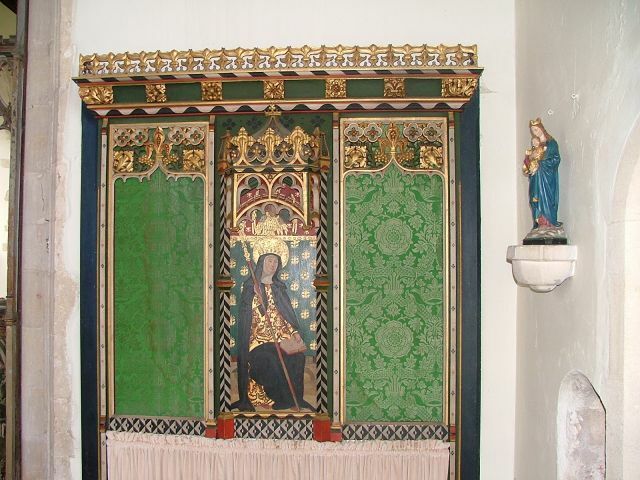 Acle's screen is intricate and lovely, the narrow chancel arch making it taller than it is wide. 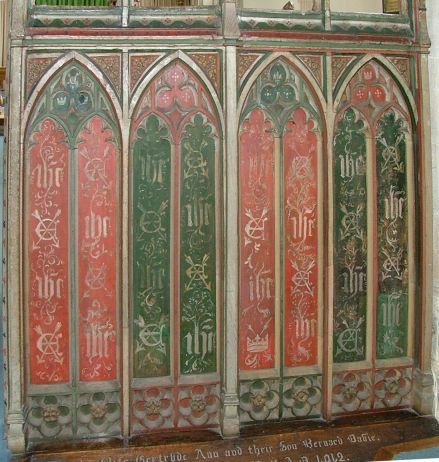 The dado panels are painted in familiar reds and greens, and stencilled with monograms of St Edmund, an E interspliced with the martyr king's arrows. 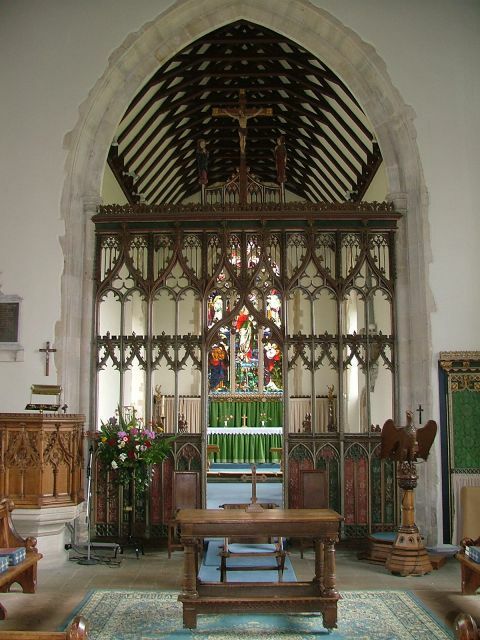 A modern rood group sits above the screen, but how elegant the whole thing must have looked in medieval times with its rood loft thrusting forward and running the full width of the nave! There were stairways to the loft on both sides; as mentioned before, the external stairwell survives on the south side, and on the north side the space has been filled in with a lovely modern window. Oh lamentable death, how many dost thou cast into the pit! Anon the infants fade away, and of the aged death makes an end. Those that wear horns or veils, fate spareth not. With prayer and with remembrance deplore death's deadliness. Dating of such things is not an exact science, but there are a couple of clues that suggest an answer. Firstly, the use of Latin and the call to prayers for the dead suggest this is before the 16th century Reformation. Secondly, the use of the words 'horns' and 'veils' seems to refer not to sinners and the righteous, but to lay and religious women - the horns probably are the horned headdress which was popular in the middle years of the 14th century. 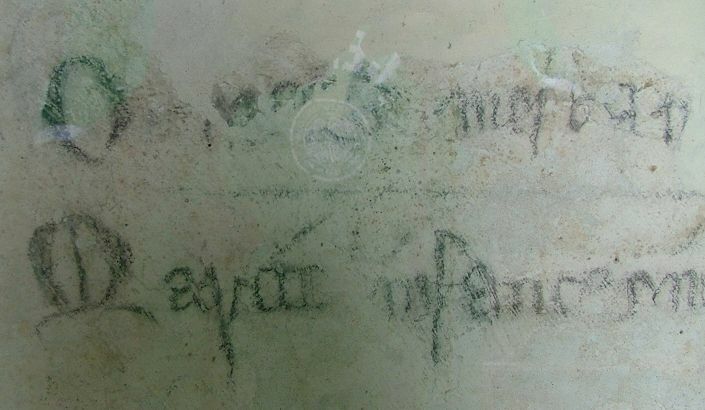 Almost certainly, then, this graffito coincides with the Black Death, a particularly virulent outbreak of bubonic plague which swept through western Europe in 1348 and 1349. How terrifying. I wonder who wrote it? The Parish Priest? Was he holed up in the church saying Masses for the dead while all around the pestilence grew and took its toll? 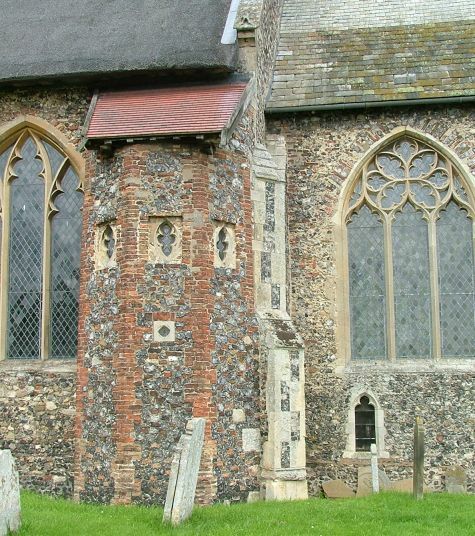 In Norfolk, the Death of 1349 carried away about half the population. Few and far between must have been the families unaffected. It changed the world for ever. It is worth pointing out that, like wall paintings, this graffito survived because East Anglia did not succumb to the Victorian fashion for raking out internal plaster to reveal bare stone. 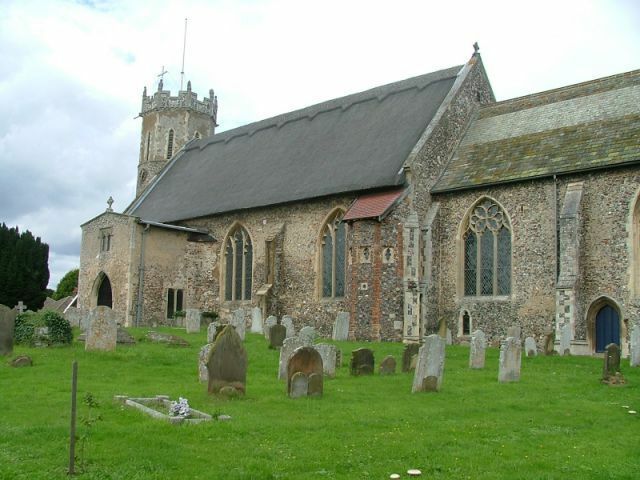 This is because there is no stone - Acle, as with almost all medieval churches in Norfolk and Suffolk, was built out of flint and clunch. Dispensing with the plaster wasn't an option. Standing here in awe may distract you from the brass beneath, but it is worthy of note. 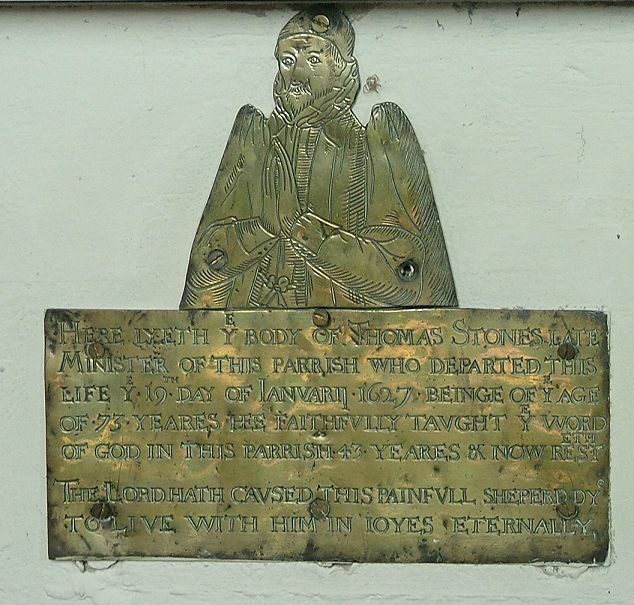 It depicts Thomas Stone, Vicar here during the reign of James I. 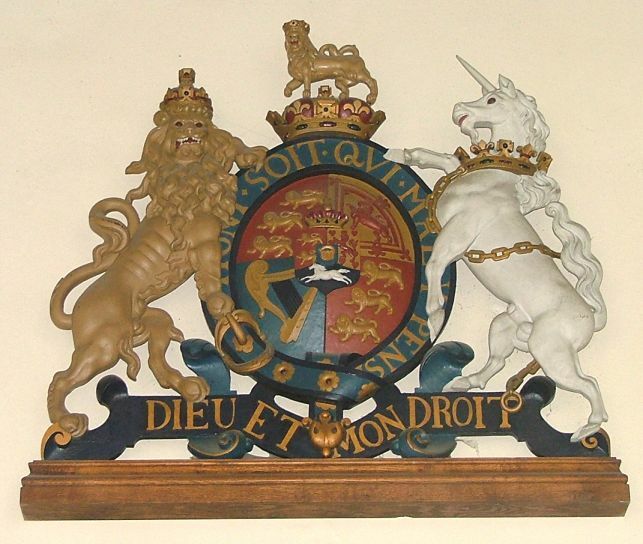 17th Century brasses of ministers are unusual in Norfolk, so it is a pity that this one is mounted on the wall. I know that parishes do this with the best of intentions, but it is a mistake. If there was a fire, the brass would melt. Floor mounted brasses don't melt - the heat rises away from them. 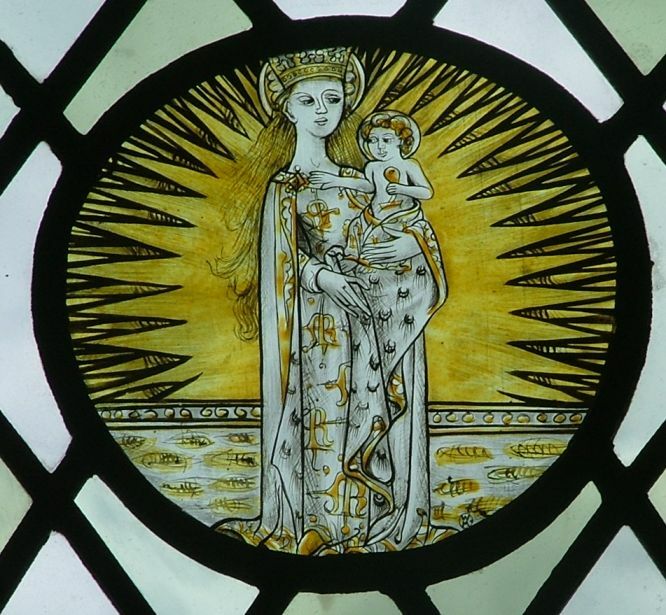 Also here in the chancel is a pretty roundel of glass depicting the Blessed Virgin and child. It's a modern replica, and a very good one, by the King workshop. You can just make out their signature near the bottom.